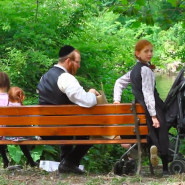 In this inspirational video, Chassidim of different kinds explain their way of life to the world. Gorgeous images and fascinating interviews. very well done. Just one thought/comment. The only time a Chassid would wear his tallis on the street is Shabbos, if he wouldn’t use an eruv. Either these men were filmed on Shabbos without their being aware/permission. Or this was staged on a weekday. maybe it was erev chag or erev Shabbat and they were leaving for minchah/arvit? This was pretty well done – fair treatment of what is a mysterious topic to the uninitiated. True, I suspect the Chassidim were being filmed without their knowledge on Shabbos! I was so impressed with Rabbi Rosenberg…and so excited he was used as a spokesman. Always was an articulate and with-it person. I was zoche to have him as a Rebbe for my sons in Cheder (that’s right—before he was in metalwork he was a beloved fifth grade Rebbe in Far Rockaway for years.) Wrought iron’s gain is chinuch’s loss…but here he is being an educator par excellence!